With accommodation like this, why worry about Mooloolaba Hotels. 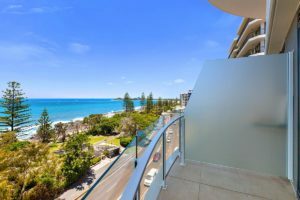 The Breeze Mooloolaba offers a five star alternative for your Sunshine Coast holiday accommodation requirements. These fully self contained holiday apartments are beautiful abodes. You’ll relish the simple but bold use of materials, the flowing living spaces and abundant light. The gorgeous chef’s kitchens are a delight to cook in. Open plan kitchen, living and dining spaces ensure that everyone can be part of the action. The matching furniture completes the ensemble of elements required for the perfect stay. Wake up every morning with floor to ceiling Coral Sea views. Open the balcony doors to feel the ocean breeze on your face. Famous for it’s picture perfect beach, Mooloolaba Beach is also a treasure trove of designer shopping boutiques. Discover shops on the Wharf, designer boutiques along First Avenue and local shops on Brisbane Rd. Refresh your swimwear, maybe find a new wrap for the beach. Perhaps a whole outfit? Who needs to worry about room service when the range of restaurants in Mooloolaba is vast and the quality superb. From fresh and contemporary Australian, Euro styles, to South East Asian. You can find it all in Mooloolaba. 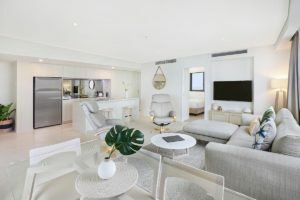 On your days in, cooking is a breeze in our designer chef’s kitchens, or perhaps you’d like to barbeque downstairs in the entertainment area beside the pool while the kids splash around in the pool waiting for dinner. What could be more perfect than dining in this delightful courtyard setting. Top off the evening with a relaxing session in the bubbling spa. Could it get any better than this? So why worry about Mooloolaba hotels. 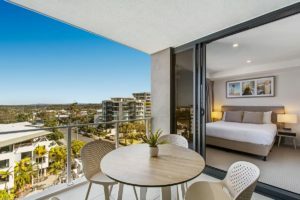 For your next holiday on the Sunshine Coast why not choose our Mooloolaba beachfront accommodation at The Breeze Mooloolaba. Book now for the best holiday accommodation in Mooloolaba.